Excessive keyword density. Don’t put too many keywords on a page. Less than five percent of your content should be keywords. Paid or low quality in-bound links. Don’t pay another website for links or followers. Weak content or duplicate content. Never use content from other sites. It’s better to link to those sites. In addition, do not repeat the same content across your pages. If content is substantially the same, it will result in a penalty (i.e., possibly a lower ranking). Few or no calls to action with value. The search engines expect to find something that provides value to the website’s visitors. Offer something: a downloadable PDF or eBook, free consultation, call or email to make an appointment, etc. At Raising the Bar Media, we adhere to white hat SEO and never sacrifice writing quality through keyword stuffing. 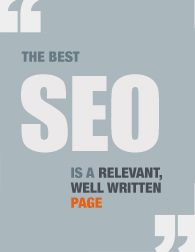 We know quality SEO writing should seamlessly include these important words. When you need an effective social marketing strategy, we create a content plan that is friendly to both search engines and your website visitors.